Jim loves potatoes. I love making home fries for breakfast, but hardly ever cook potatoes for dinner. Last night was a cold and rainy fall night, and Jim and I were both craving some warm, filling comfort food. I decided to make use of all the potatoes piling up from our coop. What I really wanted was mashed potatoes, however, I had some kale and leeks that I really needed to cook soon. 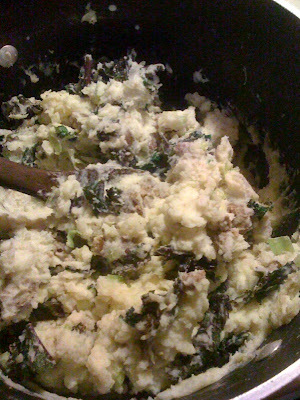 So, I decided to make my own version of the Irish dish, Colcannon. Here is the recipe for your enjoyment. 1. Boil large pot of water. I used a mixture of Red and Yukon potatoes which did not need to be peeled. If you prefer your mashed potatoes without skins, peel the potatoes first.Chop potatoes into equal size pieces and add to boiling water. Cook until soft. 2. Heat 2 tablespoons of butter in a saute pan or wok until it just starts to bubble (medium heat). Add leek and a little salt and cook until softened. 3. Add chopped kale and cook for a few minutes, just until kale starts to wilt. Don't overcook the kale, it really only needs to be heated for 2-3 minutes. 4. Cook veggie sausages or links according to package instructions. I cook my veggie links in a skillet until brown on all sides. Chop into bite-size pieces. 5. When potatoes are done, drain and mash with 2-3 tablespoons butter and about 1 cup of milk or cream. I like chunky mashed potatoes and just add a little milk as I go until I get the consistency I like. 6. Stir in Kale, Leek and Veggie Links. Add Salt and Pepper to taste. Serve. This looks a little crazy, but tastes so yummy! I did not know about this blog. This recipe sounds great!